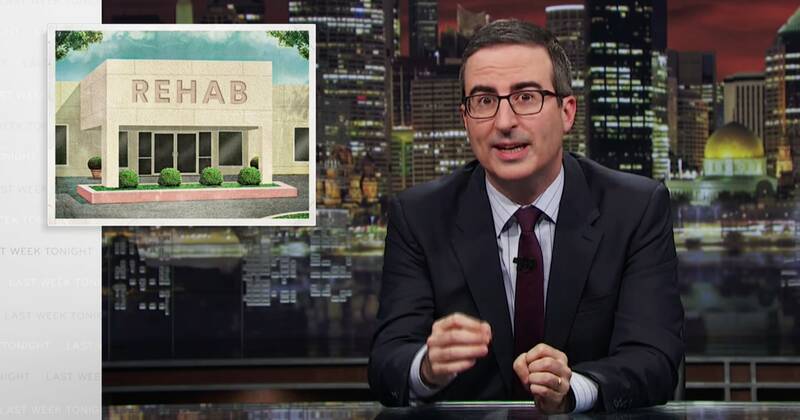 Get Help® - - John Oliver Nails It! It’s been a long time since we’ve posted a blog on www.gethelp.com. Our marketing people and product people have been optimizing and refining and trying to make sure all the rights words are tagged with all the right things; so that we can compete in a game that is being played on a massive stage, and all the while people are dying, people need help, and John Oliver explained that game perfectly last night--a game we working day and night to change. So, when I say I woke up like this, I mean it. I woke up well aware of the problems he very clearly (and humorously of course) articulated last night. Problems we’ve been working on at Get Help since 2015, and our team has been working on collectively for over 100+ years. I woke up yesterday morning to emails and text messages from friends, linking me, referring to John Oliver on Last Week Tonight. If you haven’t seen it yet take a look here: YouTube. I’m glad my friends and family have been paying attention to what we are doing. My only wish about the segment was that he didn’t have www.gethelp.com to refer to, and instead had to reference a link to finding ASAM addiction doctors. Nothing against ASAM addiction doctors, but it continues to perpetuate the idea that the solution to addiction is only medical in nature, that doctors need to prescribe drugs to get clean. While the debate is heated about MAT (and Get Help does not have an opinion and lists all sites), even referrals from addiction doctors is not as unbiased as we would like to see. It’s as if John Oliver took a look at our investor deck and our work over the last couple years. Even the statistics he quotes (e.g., the rehab industry is a $36B industry, there are 14,500+ treatment centers) are right out of our slide deck. And if they were---great---I was impressed and inspired by the entire segment, and at the same time, it made me incredibly anxious that we just are not doing enough to get the word out. People are not finding Get Help yet, and enough facilities have not claimed their listing to make sure all the data is the best. It’s time. If we want to fix the addiction rehab industry we all need to work together and stop being apathetic. I can’t keep waiting for things to be perfect. It’s going to require work. It’s going to require us being imperfect in some of our solutions. It’s going to require treatment centers getting out of their comfort zone and checking out new tools and technologies. It’s going to require more media spreading the word about tools that are actually trying to help people. The reality is that Get Help cannot afford (yet) to compete against the Goliath’s (The Fix / Rehab Review / Google) in the Google search race, not to mention the new “standards” that are being required to advertise on Google thanks to NAATP (more on that later). All we are saying is that it’s virtually impossible for reasonably priced and appropriate treatment programs to get the message out, to be found. That’s what we are doing- making it possible for people to get found based on what is best for the prospective client. Now our big task is to get the message out about Get Help so people can go directly to our site, bypassing the search engines, advertising, call centers, and brokers. Like I said, it’s not perfect yet but we are getting there. We get closer every time a facility claims a listing and a person (professional, family member, or otherwise) searches Get Help. And, what do we get for people going to Get Help? Absolutely nothing. Not a very solid business model, I know. I’ve been accused of that and told repeatedly to let treatment centers or drug companies advertise on Get Help. I say no, sometimes at what seems like our peril, but after a segment like John Oliver’s my faith and hope is strengthened. I know that what we stand for is worth standing up for. That if you don’t stand for something you will fall for anything. I know that the principles that guide Get Help are principles that cannot and will not be compromised because we are doing more than just providing a platform for people to search for treatment---we are creating a paradigm shift in the industry. Anyone can search, anytime, anywhere, and there is no brokering or selling leads. If you go to our site you can call the facility directly or go to their website. All facilities can be listed, claim their listing, and update their data and we are very proud of this. This is revolutionary. We charge a modest $20/month upgrade subscription for an enhanced listing, but it doesn’t change where someone ends up on the search. This is also revolutionary. Hopefully John Oliver won’t hold charging some kind of subscription against us. We need to pay for this somehow and our hope is that if enough facilities sign up at scale then we will be able to continue to provide this service, make our data even better, and eventually (in the not-too-distant future) provide information about facilities such that includes standards and ratings for the facilities. If you’re interested in hearing more about this please let me know. We are gathering information from professionals and will have more soon. This is the next step. In order for us to reach that milestone we need to get the word out, increase our searches, and help more people. This makes it possible to convince treatment centers to subscribe. Subscriptions give us the financial ability to make Get Help available to anyone, anywhere. It also gives us the platform from which to introduce a rating system so we can hold facilities accountable and give consumers the information they have long been waiting for. Listen, we are taking on a $36B Industry and we can’t do it alone. Nonprofits and government have not been able to do it yet. They’ve been trying for a long time and have not been successful. Treatment programs cannot regulate themselves; it requires someone who knows about the industry and is not financially incentivized by the treatment centers. Namely, doctors like ourselves. What can you do to help? If you are a treatment center claim your listing or listings and subscribe. If you’re a consumer, friend, or ally interested in furthering our cause then spread the word. Follow us on Twitter @GetHelpDotCom and join us on FaceBook, share about us with your friends and colleagues. Go to the iTunes or Android Store and download our app or save Get Help on your favorites or bookmark. Do something. Do it now.